Het appartement in Málaga stad heeft 2 slaapkamer(s) en kan gereserveerd worden tot 4 personen. De accommodatie heeft een oppervlakte van 100 m². Uw acommodatie ligt in een kindvriendelijke buurt. Tevens heeft u de beschikking over Lift, Tuinmeubilair, 110 m² terras, Strijkijzer, Internet (wifi), Haardroger, Airconditioning (warm / koud), Airconditioning, Garage in Een gebouw dichtbij, 1 Televisie, Satelliet tv (Talen: Spaans, Engels). De open keuken, met inductie kookplaat, is uitgerust met koelkast, magnetron, oven, vriezer, wasmachine, vaatwasmachine, servies/bestek, keukengerei, koffiezetapparaat, broodrooster en waterkoker. - 2 Badkamers met douche, Haardroger. - 1 Televisie, Satelliet tv (Talen: Spaans, Engels), Verdieping 7, Lift, Tuinmeubilair, 110 m² terras, Strijkijzer, Internet (wifi), Haardroger, 100 m² vloeroppervlak, Airconditioning (warm / koud), Airconditioning, Garage in een gebouw dichtbij. Borg (Terug betaalbaar): - Bedrag: € 200,00 /reservering. - Betalingswijze: Één kaartnummer wordt gevraagd als onderpand. - Dient ter plaatse betaald te worden. Parkeerplaats op basis van beschikbaarheid. Location and terraces are spot on. Elevator was very good. The apartment was very well equipped and comfortable. Fantastic views of the city and mountains. Numerous restaurants within a few minutes walk. The Solaga representative met us as we arrived and the information provided was excellent. We will use Solaga in future. Foot switch lamps at side of bed are not practical. There were 2 single duvets on a double bed which doesn't work. As there was only 2 of us we were able to change it over from other bed. If there had been 4 of us it would have been a problem. Location, 2 bathrooms in this 2 bed apartment. BBQ on the terrace would be nice. Great stay at Mercedes, our third , and favourite Solaga property.Great service and communication throughout with the Solaga team! Thank you, I'm sure we'll be back! The location was superb - very convenient for shops and restaurants with only a short walk into the historic old town. The large terrace gave a splendid view out over the town. The apartment is very comfortable. We took the bus a few times as the stop is virtually right outside. Solaga staff were, as ever, friendly and helpful. I don´t know if it is within your remit but the lift was a bit frightening and as the apartment is on the 7th floor we did not fancy the walk. We noticed there is no inspection certificate as is often the case in Spanish properties. The Spanish owners of the apartment next door also confirmed that they shared this apprehension and had raised it with the building supervisors. We had everything we needed in the apartment. In addition, we were close to everything that we needed – shops, cafes, restaurants, etc. 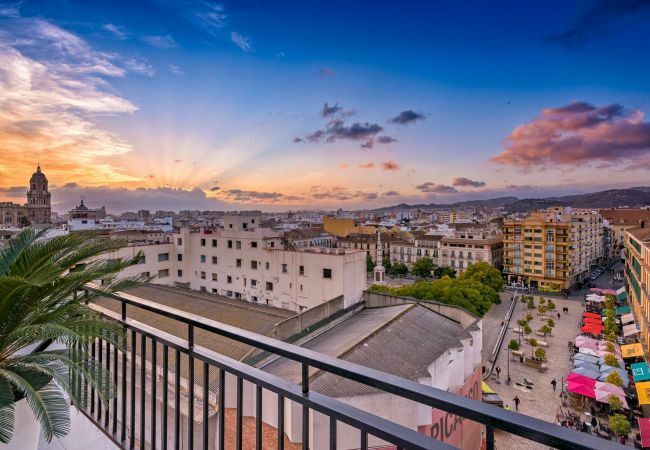 I would recommend this apartment – and Solaga – to anyone wanting a holiday in Malaga. I would add that Galen was more than helpful when we arrived pointing out the various amenities, etc., within the immediate area. Thanks Galen! It was appreciated. 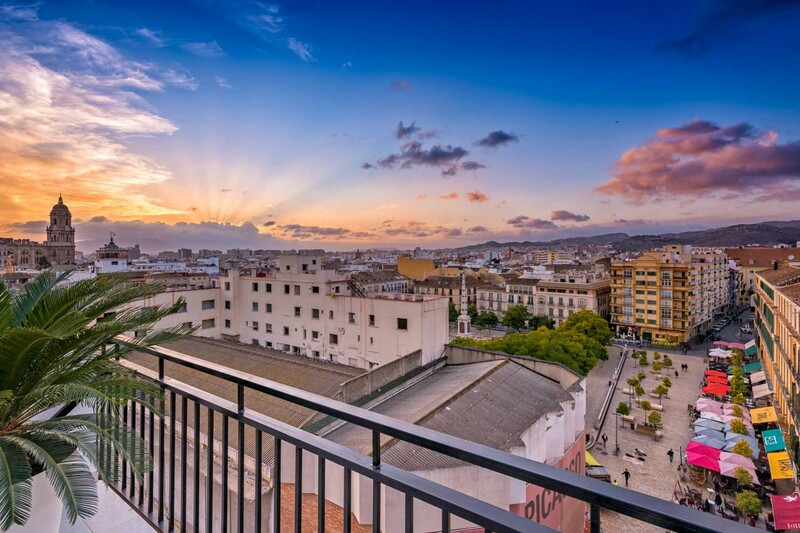 Apartment Mercedes is the perfect place to stay in Malaga. We loved the convenience of the location, the views from both terraces, and the general ambiance of the apartment. The service was excellent also. If using the transport service, ask for Paco - he´s the best! Very nice place with two great terraces and a magnificent view over the city. Perfect for two couples. Many good restaurants and shops in the neighborhood. We enjoyed it a lot! Spacious apartment, great terraces, everything you could want from a holiday home. First class Service from Solaga. The apartment was excellent in its decor, comfort and facilities. It's difficult to find comments to improve their Service but here are some small points. When paying the deposit for the apartment it would be helpful to give the option of paying by credit card, as they do for the balance of the rental, as some clients may not have a PayPal account. As there were only two of us some smaller pots would have been appreciated. Naturally, the TV programmes were in Spanish but, as I said to Romina, if the clients come armed with the "films on tv" app on their iPad,phone then they can a large variety of programmes in German, French and English ( including the normal uk channels) to watch on the TV and to facilitate that, a long hdmi cable would be convenient. We have often flown into Malaga on route to the Costa Del Sol hotspots but this is the first time we have stayed in Malaga, which was a good decision as Malaga offers the same facilities as these other hotspots but blends them into a working city and so enhances the benefit of a holiday abroad. The Mercedes apartment is everything it is described as. Perfectly situated in the old town with bars and restaurants on your doorstep and the beach a 10 minute walk away. A stunning apartment with fabulous terrace . We had a wonderful time in Malaga .Definitely recommend. The Apartment Mercedes was wonderful and suited well for our 4+1 group. The place is located right next to the historical centre of the city. Communication with the Solaga team was superb. I can highly recommend this accommodation. A modern apartment on the very top of an ancient (slightly seedy)building, it met and exceeded our expectations once we got over a little culture shock. (No Dorothy, you are not in Kansas anymore). Solaga staff was efficient and helpful. You can trust their description of the apartment. Best of all was the terrace, where every evening we gathered to watch the sunsets with a cup of gelatoglass of an adult beverage. The Hop-On, Hop Off bus stop is literally across the street from the apartment entrance as is the Plaza Mercede, with a lively but not obnoxious bar and tapas scene where the action can stretch well past most Norte Americanos bedtimes.. Excellent new doors and windows plus good air conditioning minimized the street noises. Finally, you are literally only a blockso away from the fantastic cathedral and Roman Theatre and our favorite restaurant El Pimpii. Highly recommended if you want to feel immersed in the Malagan neighborhood lifestyle while having a sanctuary to retreat to and can handle tiny elevators that creak and the occasional noise of the real living going on around you. My girlfriend and I thoroughly enjoyed our first trip to Malaga and this apartment was fundamental to that. It is exactly as the photos show and in a great location. The service we received from the hosts was very professional and welcoming. Having the two private terraces is fantastic, great places to enjoy any time of day and a great retreat from the city. You won't be disappointed. We were 2 couples on a short break in Malaga staying in the Mercedes apartment. The apartment suited our needs in every way. The location overlooking the square was excellent, and the terrace facilities superb for sundowners over the city skyline. The apartment was newly decorated and very well equipped. It was very clean and had all the facilities and comfort we required. The management of our stay was very straightforward. We were met at the apartment where everything was explained. All communication prior to the holiday was prompt and clear. We were greeted at the apartment by a representative who was very friendly and explained everything we needed to know. The apartment was in a great location, very modern and well equipped with a huge outside space which is fantastic for a city location. We thoroughly enjoyed our stay and will definitely be returning. Great hosts, easy to get in touch with and very service minded. The apartment was beautiful, we liked the large balcony and the rooftop terrace a lot!